Xie et al, in a recent paper in PNAS, report that multiplex gene editing with CRISPR-Cas9 can be accomplished by producing multiple sgRNAs from a single transcript that is processed by the plant’s endogenous tRNA-processing pathway. One of the elegant aspects of the CRISPR-Cas9 system is the ability to perform ‘multiplex’ genome engineering, simultaneously inducing mutations at many genomic targets. When working in cell culture, embryos, or other systems where the CRISPR-Cas9 reagents are introduced directly the process of multiplex gene editing is simple: add another sgRNA (produced by in vitro transcription) to your transfection or injection mix and induce additional mutations. As easy as that. However, there are many applications of CRISPR-Cas9 where the Cas9 and the sgRNAs must be genetically encoded. For example, when packaging Cas9 and sgRNAs into a retrovirus with a limited payload capacity or designing a transgenic cassette for a gene-drive (a.k.a. ‘mutagenic chain reaction’) strategy, the addition of an additional sgRNA with its own promoter can create an unmanageably large package. tRNAs are normally produced from long transcripts, which, in some cases, will simultaneously produce small RNAs such as snoRNAs. 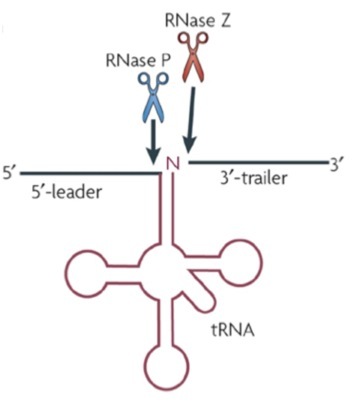 The enzymes RNAse P and RNAse Z recognize the characteristic cloverleaf structure and cleave at the 3’ and 5’ ends of the tRNA. By inserting sgRNAs between tRNAs, transcript processing by RNAse P and RNAse Z, simultaneously produce fully functional sgRNAs (sgRNAs which are also freed from promoter-driven sequence requirements in the first few bases). The authors call these transcripts polycistronic tRNA-gRNA (PTG) genes. The contribution of this paper is a proof-of-principle demonstrating the feasibility of “hijacking” the endogenous tRNA processing pathway to produce multiple sgRNAs from a single transcript. This is an improvement over another system that relies on the Csy4 endoribonuclease [1-2] as that system required the expression of an additional transgene, negating any size benefits of expressing sgRNAs in a polycistronic manner. While it remains to be seen whether or not this trick will translate to other organisms, including insects, the authors note that the tRNA processing machinery is highly conserved across taxa. Potential side-effects also need to be watched for, including the sequestration of tRNA-processing machinery and overabundance of artificial tRNAs excised as part of this technique. Nonetheless, this is a clever addition to the CRISPR-Cas9 toolbox, and potentially opens the door to more complex multiplexed editing strategies in plants and beyond. Xie, K., Minkenberg, B., Yang, Y., 2015 Boosting CRISPR/Cas9 multiplex editing capability with the endogenous tRNA-processing system. Proceedings of the National Academy of Sciences 112: 3570-3575doi: 10.1073/pnas.1420294112. Nissim, L., Perli, S. D., Fridkin, A., Perez-Pinera, P. & Lu, T. K. Multiplexed and programmable regulation of gene networks with an integrated RNA and CRISPR/Cas toolkit in human cells. Mol. Cell 54, 698–710 (2014). Tsai, S. Q. et al. Dimeric CRISPR RNA-guided FokI nucleases for highly specific genome editing. Nat. Biotechnol. 32, 569–576 (2014).